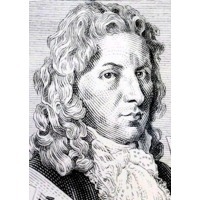 Stamitz's most important compositions are his 58 symphonies and his 10 orchestral trios. The orchestral trios, although frequently classified as symphonies, are actually somewhere between the symphony and the chamber trio, and may be played with or without doubling of parts. Stamitz was also a composer of concertos. These include, in addition to his numerous violin concertos, two for harpsichord, 12 for flute, one for oboe, and one for clarinet - among the earliest concertos for the instrument (Johann Melchior Molter's six from the 1740s seem to have been the first). He also composed a large amount of chamber music for various instrumental combinations, as well as eight vocal works including his widely circulated concert Mass in D.
Due to at least five other musicians of the 18th century bearing the surname Stamitz, including four from Johann's immediate family, any attempt to catalog Stamitz's works is risky at best, principally in view of the many variations in spelling. Actually, few difficulties arise in distinguishing between works by Johann Stamitz and those of his sons Carl and Anton. By contrast, the relationship of the names 'Steinmetz' and 'Stamitz' has caused substantial confusion, as at least two other musicians called 'Steinmetz' lived in the 18th century. Stamitz expanded the orchestral score, making the winds essential for the composition. His symphonies of the 1750s are scored for eight parts; four strings, two horns, two oboes, although flutes and clarinets may substitute. Horns not only provided a harmonic backdrop for strings, but solo lines as well, and he was also one of the first composers to write independent lines for oboes. The chief innovation in Stamitz's symphonic works is their adoption of the cycle of four movements, with a fast/slow pair followed by a minuet and trio in the third movement, ending with a Presto or Prestissimo movement. While isolated examples of this structure exist previously, Stamitz was the first composer to use it consistently: well over half of his symphonies and nine of his ten orchestral trios are in four movements. He also contributed to the development of sonata form, most often used in the first movements of symphonies. Stamitz also adapted and extended traits originally developed in the Italian opera in his compositions. He added features in his pieces such as extended crescendo passages and other dynamic effects. Stamitz also incorporated simplified tutti chordal textures, sectionally specialized scores, and slow harmonic motion. Like Italian operas, Stamitz's compositions have a strong sense of rhythmic drive and distinctive thematic material within the exposition.